(2016). Synthesis and assessment of antibacterial effects of CdSe:Ag nanoparticles produced by chemical precipitation method. International Journal of Bio-Inorganic Hybrid Nanomaterials, 5(2), 147-152.
. "Synthesis and assessment of antibacterial effects of CdSe:Ag nanoparticles produced by chemical precipitation method". 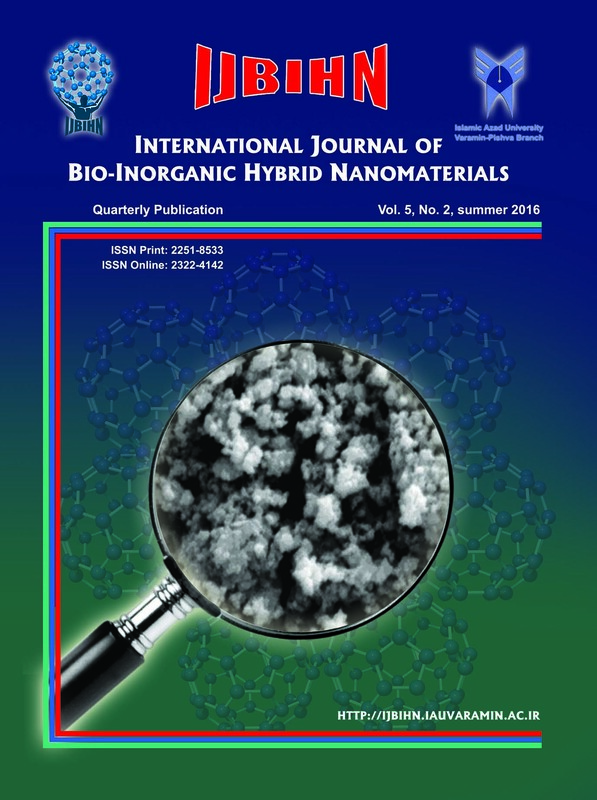 International Journal of Bio-Inorganic Hybrid Nanomaterials, 5, 2, 2016, 147-152. (2016). 'Synthesis and assessment of antibacterial effects of CdSe:Ag nanoparticles produced by chemical precipitation method', International Journal of Bio-Inorganic Hybrid Nanomaterials, 5(2), pp. 147-152. Synthesis and assessment of antibacterial effects of CdSe:Ag nanoparticles produced by chemical precipitation method. International Journal of Bio-Inorganic Hybrid Nanomaterials, 2016; 5(2): 147-152. Chemical precipitation method was used in order to synthesize CdSe:Ag quantum dots (2-3 nm). Their Physical properties and characteristics were assessed by X-ray diffraction, ultra violet-visible spectrophotometer and TEM (Transmission Electron Microscope) and it was shown that the obtained CdSe:Ag quantum dots are cubic with high-quality. Antibacterial effects of CdSe:Ag nanoparticles against some pathogen bacteria were investigated. Pseudomonas aeruginosa, Staphylococcus aureus and Salmonella typhi were used as test microorganisms. Disc bacteriological tests were used in order to assess the effects of CdSe:Ag concentrations 13.4-1.05 mg/ml as antibacterial agent. And the MIC (Minimum Inhibitory Concentration) and MBC (Minimum Bactericial Concentration) of CdSe:Ag nanoparticles which are required to inhibit the growth of these three bacteria is determined by applying Broth Dilution Method. According to the results, by increasing the concentration of CdSe:Ag the inhibiting effect rises. The MIC values to inhibit the bacteria Pseudomonas aeruginosa, Staphylococci aureus and Salmonella typhi are 4.2, 3.35 and 6.7 and the MBC values to do so are 13.4, 8.4 and 13.4, respectively. In conclusion, by increasing the nanoparticle concentration in wells and discs, the growth inhibition and diameter of inhibition zone has also been increased.